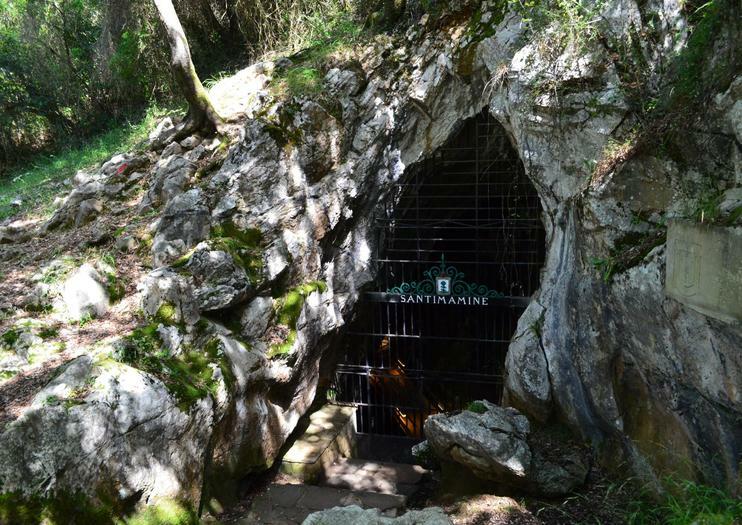 The caves at Santimamine were one of the most important archaeological discoveries in the Basque Country, with cave painting and artifacts dating back to the Magdalenian period of the Late Paleolithic era (13,000 BC). Its discovery in 1916 was a complete accident, by two local boys who were playing by the cave’s entrance. Archaeologists discovered primitive depictions of bison, deer, horses and bears from several different ancient cultures painted on cave walls, as well as large stalactite and stalagmite formations throughout. Geological conditions and excess of iron oxide have created white and red coloring on many of the cave walls. The location of the caves is scenic in itself, sitting on the bank of the River Urdaibai with Ereñozar Mountain as the backdrop. Though restorations are underway, the cave can be visited with a private tour by a local guide. The information center is open daily from April to October from 10 am to 2 pm and 3 pm to 7 pm, with hours running 9:30 am to 2:30 pm the rest of the year. Guided visits are available hourly starting at 10 am. General admission is 5 Euros with reduced rates for seniors and groups.